I know end of year posts can be either fun or a bit tedious (because, hello, I've been reading your blog all year - what do you mean you don't only write for me?!) - I mean, I normally do it anyway so my criticism of the practice is a bit unjust, but this year I'm trying something different. The last few months, I suppose the last few years really, but especially over the winter months, I've been in more of a reflective mood and I want to write about topics that have been on my mind for quite a few months now, but have been all jumbled up. Maybe this could be a sewing inspired New Years resolutions list for 2014? I've bolded items to make it easier for me to stay focused when I was writing; hopefully it helps you read the "list" and isn't too distracting. This isn't about more sewing or making time or any other standard wishes because I've had a list of items I want to make going back to March and I haven't made a single item on it, and I currently have no plans to start. And to be perfectly honest I'm not going to postpone dinner or time with my loved ones or even stop binging on Netflix for an extra hour of sewing each night. I want to slow things down a bit and I might make less. Part of the whole deal with sewing my own wardrobe was that I planned on having higher quality and better fitting clothing. And I can't say that's the case. A lot of times I'll force something to work because I'm tired of dealing with it, I need to finish for a deadline (self-imposed or otherwise), or I'll just slap it together because it's still nicer than RTW. I'm not talking about mistakes I make as a beginner. I like my mistakes because that's how I learn. (For real! How else am I supposed to know the importance of finishing seams unless a skirt unravels?) I'm talking about the lazy short-cuts that mean after 1-2 real-life wearings my new dress or skirt has to be tossed into my mend pile, and I haven't touched my mend pile all year ever. I don't need that many clothes. I had a shopping problem when I was younger and it resulted in hundreds of dollars on clothing (probably more) that still have the tags on to this day. When I was terribly poor I stopped shopping completely and when I started getting a little bit of money again, I learned to sew. I don't want another closet full of clothing I'll never wear, regardless of whether or not it's handmade ESPECIALLY because it's handmade. 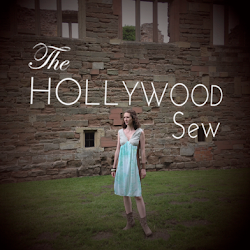 My awesome handmade clothing needs to be seen and properly admired. Additionally, I want to really think and plan out a proper wardrobe. Making lots of vintage dresses but neglecting the (zero) pants and loungewear situation is a problem. I want to focus on gaps in my outfits and really have a well-crafted wardrobe. I will start paying full price for patterns I love and want this year because I finally realized if my dream pattern is out there, it's so much easier to buy that than to get a different one for less and spend hours of my life figuring out how to modify it. I hated having a box full of patterns that I knew I'd never use. Why not invest my time and money into something I'll love rather than investing in hours of frustration? I'm going to focus on fabric. I have an overflowing fabric stash. Some of it is really nice silk I bought almost two years ago that I was afraid to cut into and others are terribly cheap polyester that reflects the light. I've been trying to make a dress with the cheap polyester because it's pinstriped and it looks business-y, but it's going terribly and, let's be honest, I'd pass it in a second if I saw that fabric in the store. Just because something is free or cheap, doesn't mean I need to wear it and walk around in a highly flammable outfit. So cheap fabric is out. Nice fabric will be used. I'm going to alter patterns, rather than making them straight out of the envelope. While I'm not proportional at all, I can typically make something exactly as is and have it fit me moderately well. However, if that's the case, why am I making my own clothing and not buying RTW? I am going to start doing a FBA at the very least on all of my patterns from now on. I'm going to learn how to properly draft a pattern. I keep telling myself I'm going to take the pattern making class at FIT, but let's be real. That's not going to happen. For my birthday earlier this year, I purchased a 1920s draping book and a 1930s pattern making book . I've only flipped through them thus far, and I intend on learning because I have so many ideas for clothing I want to make that I cannot find for sale. I'm going to mend and refashion. This ALWAYS makes a list of goals I have, and I could easily dedicate another closet (you know, if I had one) to my mend/refashion pile. I'm going to go through and start figuring out what could be done with them. As I have problems with my imagination when it comes to improvising for myself, I will probably post pictures of "before" clothing to get ideas for the "after." They typically already look great, but I don't wear them so I must change them. There will be more crafts! Seriously, I have a ton of crafts on pinterest that I want to make but never get around to doing. I have some crafty friends, but it's so hard to organize groups when people have to think about friends, family, work, and, of course, the hour long subway trips to get around the city. I'm going to find crafty people wherever I can and drag them back to my place. One crafty project a month - surely I can manage that! So yes, there's the list. I have quite a few more ideas for where I want to take my sewing and knitting in the next year, but right now they're just ideas whereas this list is very feasible and easy to share. Hopefully now that I've acknowledged my problems I can magically grow and take my sewing to the next level and you guys will continue to love it! Any sewing resolutions for you guys? These are great goals! I think focusing on fabrics that are really quality that you really like is so important. I have the same issue with yarn that I really love and am afraid to use. The best part about fabric is that you can always get more fabric! I'm still new so it's ll learning. I ill try o cut out better, eg bother with notches! I want to get more confident with machine buttonholes, shirts scare me! Great list! I'm planning to do some refashioning, too, thanks to pinterest. I want to make some of the beautiful vintage patterns that I was gifted, too, and start early on the gifts that I want to make. Happy new year to you! See you in 2014!